"Only one manufacturer coupon is accepted for each product, unless coupled with another manufacturer coupon found in a Rite Aid circular." A: The video values coupons are considered Rite Aid coupons and, thus, may be combined as you propose. "Any manufacturer coupons that may be presented with a total purchase coupon will be deducted after the purchase total has been determined." Q: What about other Rite Aid coupons? If I had $25 worth of merchandise, could I use a $5 off $25 coupon and a $3 rite aid coupon? Or would I have to have $28 worth of merchandise in order to use both? 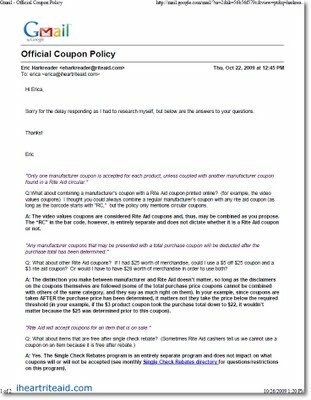 A: The distinction you make between manufacturer and Rite Aid doesn’t matter, so long as the disclaimers on the coupons themselves are followed (some of the total purchase price coupons cannot be combined with others of the same category, and they say as much right on them). In your example, since coupons are taken AFTER the purchase price has been determined, it matters not they take the price below the required threshold (in your example, if the $3 product coupon took the purchase total down to $22, it wouldn’t matter because the $25 was determined prior to this coupon). "Rite Aid will accept coupons for an item that is on sale." A: Yes. The Single Check Rebates program is an entirely separate program and does not impact on what coupons will or will not be accepted (see monthly Single Check Rebates directory for questions/restrictions on this program). please note, this bulletin is intended for employee use. if you are looking for a policy to bring with you to the store, use the latest customer policy. coupons cannot be exchanged for cash. 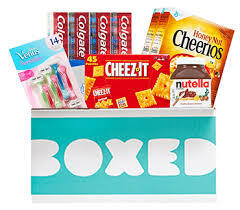 this includes, when a customer makes a return for a product that had a coupon attached, rite aid cannot refund cash for the value of coupon when identified. "savvy coupon customers can buy $50 in merchandise and after they presented all their coupons, they paid $5. my store is taking a big loss here." in reality the vast majority of savvy coupon shoppers are using manufacturer coupons (49's and 5's) which are fully reimbursed by the manufacturers. 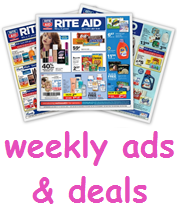 these sales are profitable for rite aid, provided the guidlines discussed above are followed. these savvy customers are to be treated with the same courtesy we show to other customers.